Brighton is well served by transport links and is just an hour away from London by train, so getting to BREMF events is very easy, however you choose to arrive. 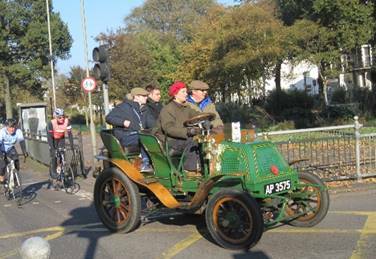 In early November one of our Festival weekends usually coincides with the London to Brighton Veteran car run and we enjoy watching all the pre-1905 cars rolling into the city! Trains to Brighton run from London Victoria, St Pancras, London Bridge and Blackfriars, with the journey taking around one hour and trains running into the late evening for returning after concerts. The train company websites below give full information on train times and tickets, and most have advance purchase fares which offer very good value. Brighton is also connected to Portsmouth, Southampton, Chichester, Worthing, Eastbourne, Hastings and Ashford (Kent) by Southern Railway Coastway line. The nearest airport to Brighton is London Gatwick (about 30 minutes by train). There is also a direct train connection to Brighton from Luton Airport. If you are travelling to our events by car, please allow plenty of time for parking. Payment by phone - pre-register online or by phoning 01273 458458. An app is available for smartphone users but a smartphone is not essential to use the service. Pay with cash at a PayPoint store - find one by postcode or see suggestions under some venues on the venues page. Travelling from overseas: Brighton has direct train links from St Pancras International as well as Gatwick and Luton airports. See accommodation for details of places to stay. Travelling from Brighton, Sussex or elsewhere in the UK: See venues page for details of bus routes near each venue, as well as the nearest place to park your car.